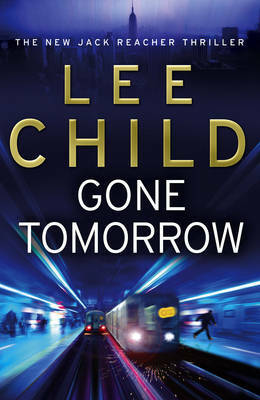 GONE TOMORROW is a typical Jack Reacher thriller. If you like this series, you'll know exactly what to expect and you won't be disappointed (as you might have been in NOTHING TO LOSE, Reacher's previous outing). Reacher, as he likes to be known, is a capable, kind, tough-guy ex-army MP. He's also a drifter, wandering around America (usually) - in the earlier books he seemed to be looking for closure and resolution to some of his mysterious, covert past, but now that many of those plots seem to have run out, in recent books he travels around relatively aimlessly. Each novel tends to start with Reacher accidentally stumbling across trouble of some kind - he then follows a trail to sort out what is really going on, cuing lots of military, special-agent and police details as well as plenty of action. The story usually includes a brief relationship between Reacher and a woman, but by the end of each novel he has sorted out the main business and is setting off for a new, unknown destination. In GONE TOMORROW, the plot follows the usual arc. At the beginning of the novel, Reacher is randomly taking a subway ride in New York in the early hours of the morning, as you do, when he notices a woman who fits almost every item on the Israeli government's secret list of "tell tale signs of a suicide bomber". Keeping a close eye on the few other occupants of the carriage, he eventually decides he has to intervene - with devastating consequences. I'm not going to reveal any more of the plot here as that would destroy the fun of this somewhat formulaic (but enjoyable) novel. Suffice to say that soon enough, Reacher becomes involved with the NYPD and a capable detective there called Theresa Lee; the brother of the potential suicide bomber, who is a New Jersey cop; the FBI; a congressman who aspires to be a senator, another ex-military guy who has certain attitudes in common with Reacher; various indeterminate mobsters; and some rich Ukrainian refugees. As the seasoned Lee Child reader has come to expect, quite a few of this cast of characters are not what they seem (not least the suicide bomber and the Ukrainians), and Reacher spends much of the middle part of the story working out what he thinks is going on, travelling between the groups to confront them, finding out he was wrong, re-thinking, etc. As is usual in this series, Reacher is fairly slow off the mark, working things out wrong and having to rethink his options - but this is always OK because friends and foes alike are all considerably more stupid than him. The whole is all highly and undemandingly readable as we feel that we are getting an insight into a life we don't know, for example US military strategy during the Afghan-Russian wars of the 1980s, the inner workings of the New York subway system, the provenance of various kinds of guns, or how sports jocks in LA live - but pushing the plot forward fast is not part of the package. To like these books you have to like all these slow details - of how to get a room in a NY hotel for less than $100 a night or what it is like to while away hours in bookshops, on trains, in coffee shops or on park benches (Reacher's usual lifestyle). By the end of the book, Reacher - backed up by the few people he has come to trust after numerous attacks, kidnappings, ambushes, etc - has finally worked out what is really going on, which is rather exciting and quite satisfying. I hope it isn't giving too much away to reveal that he walks off into the sunset with his ATM card, toothbrush and out-of-date passport (his only possessions) - still the same old Reacher, and doubtless off to find some similar adventure in some other US city or county this time next year.